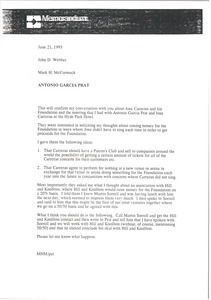 Asking him to respond to the attached letter and resume from Antoni Diehl and says that Edna can meet with him if she wishes. Please note that the resume is not digitized. 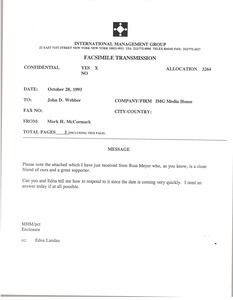 McCormack asks Webber to follow up on the attached letter from Mrs. Gwyneth Dunwoody of the London House of Commons, who proposes harpist Ieuan Jones as an IMG client. 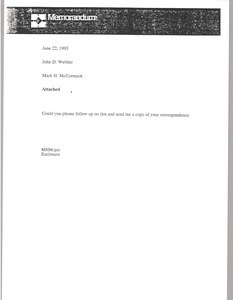 Regarding an attached letter from Hampton Court Palace, McCormack would like to renew for a long period of time. The letter says that they enjoyed working with IMG on the Hampton Court Festival. Discussing a televised opera talent contest. McCormack is asking if there is a way they could get involved in this idea, and expresses his disappointment that they are unable to develop these ideas themselves. Attaches letter from Peter Bates, Sales and Marketing Director of The Savoy Group of Hotels, in which he praises IMG's involvement with the Sudeley Festival at Sudeley Castle in the Cotswolds. Discusses meeting with Jose Carreras and Antonio Garcia Prat, General Manager of Jose Carreras International Leukaemia Foundation. Shares ideas about raising money for the Foundation. Also, sends ideas about Hill and Knowlton and Martin Sorrell. Asks for thoughts about Richard Ogden, though sure IMG has nothing for him. Cover letter attached. Resume not digitized.